Sicilians or the Sicilian people (Siciliani in Italian and Sicilian, or also Siculi in Italian) are the Romance-speaking ethnic group indigenous to the Italian island of Sicily, the largest island in the Mediterranean Sea as well as the largest and most populous of the autonomous regions of Italy. The Sicilian people are indigenous to the island of Sicily, which was first populated beginning in the Paleolithic and Neolithic periods. The aboriginal inhabitants of Sicily, long absorbed into the population, were tribes known to the ancient Greek writers as the Elymians, the Sicanians, and the Sicels, with the latter being an Indo-European-speaking people (likely Italic) after whom the island was named. From the 11th century BC, Phoenicians began to settle in western Sicily, having already started colonies on the nearby parts of North Africa. Sicily was later colonized and heavily settled by Greeks, beginning in the 8th century BC. Initially, this was restricted to the eastern and southern parts of the island. As the Greek and Phoenician communities grew more populous and more powerful, the Sicels and Sicanians were pushed further into the centre of the island. By the 3rd century BC, Syracuse was the most populous Greek city in the world. Sicilian politics was intertwined with politics in Greece itself, leading Athens, for example, to mount the disastrous Sicilian Expedition in 415 BC during the Peloponnesian War. The constant warfare between Carthage and the Greek city-states eventually opened the door to an emerging third power. In the 3rd century BC the Messanan Crisis motivated the intervention of the Roman Republic into Sicilian affairs, and led to the First Punic War between Rome and Carthage. By the end of the war in 242 BC, and with the death of Hiero II, all of Sicily except Syracuse was in Roman hands, becoming Rome's first province outside of the Italian peninsula. For the next 600 years, Sicily would be a province of the Roman Republic and later Empire. As the Roman Empire was falling apart, a Germanic tribe known as the Vandals took over Sicily in 468 AD (after taking Carthage in 439 they tried several times but failed to take the island) under the rule of their king Geiseric. However, they soon lost these newly acquired possessions, except one toehole in Lilybaeum, to Odoacer in 476 and completely to the Ostrogothic conquest of Sicily by Theodoric the Great which began in 488; although the Goths were Germanic, Theodoric sought to revive Roman culture and government and allowed freedom of religion. The Gothic War took place between the Ostrogoths and the Byzantine Empire, and during the reign of Justinian I, Sicily was brought back under Greco-Roman rule, and Greek language and religion were embraced by the majority of the population. It was Syracuse where the Byzantine Emperor Constans II desired to move his capital in 663 AD, a decision which eventually led to his assassination. Sicily remained under Byzantine rule for several centuries, until an invasion by Arab Muslims (Aghlabids) in the 9th century. The Muslim conquest was a see-saw affair; the local population resisted fiercely and the Arabs suffered considerable dissension and infighting among themselves. Not until 965 was the island's conquest successfully completed, with Syracuse in particular resisting almost to the end. In the 11th century, the mainland southern Italian powers were hiring Norman mercenaries, who were Christian descendants of the Vikings; it was the Normans under Roger I who conquered Sicily from the Muslims over a period of thirty years until finally controlling the entire island by 1091. In 1130, Roger II founded the Kingdom of Sicily as an independent state with its own Parliament, army and currency, while the Sicilian culture evolved distinct traditions and customs not found in mainland Italy. The Siculo-Norman rule of the Hauteville dynasty continued until 1198, when Frederick I of Sicily, the son of a Siculo-Norman queen and a German emperor ascended the throne. His descendants governed Sicily until the Papacy invited a French prince to take the throne, which led to a decade-and-a-half of French rule under Charles I of Sicily; he was later deposed in the War of the Sicilian Vespers, which put the daughter of Manfred of Sicily Constance II and her husband Peter III of Aragon on the throne. Their descendants ruled the Kingdom of Sicily until 1401. Following the Compromise of Caspe in 1412 the Sicilian throne passed to the Iberian monarchs from Aragon and Castille. The Spanish era ended in 1735, when Charles V was crowned king. For the better part of the next century-and-a-half, Sicily was in personal union with the other Southern Italian Kingdom of Naples, with the official residence located in Naples. In 1861, however, Sicily became part of the Kingdom of Italy as a result of the Risorgimento. After the unification of Italy and the Fascist era, a wave of Sicilian nationalism led to the adoption of the Statute of Sicily, under which the island has become an autonomous region. Since 1946, the island enjoys the most advanced special status of all the autonomous regions, which allows the Sicilian residents to keep 100% of the revenue from all the taxes, without giving back any to the central government in Rome. Sicily has experienced the presence of a number of different cultures and ethnicities in its history, including the original Italic peoples (Sicani, Siculi and Elymians), Phoenicians and Carthaginians, Greeks, Romans, Byzantine Greeks, Arabs, Normans, Swabians, Lombards and Italians, Aragonese, Spaniards, French, and Albanians. About five million people live in Sicily, making it the fourth most populated region in Italy. However, in the first century after the Italian unification Sicily had one of the most negative net migration rates among the regions of Italy because of millions of people moving to the Italian mainland and countries like Germany, the United States, Canada and Australia. Many Sicilian communities, including those formed by the descendents of the Sicilian migrants, are all over the world. It is estimated that the number of people of Sicilian descent in the world is more than six million. The most famous community is represented by the Sicilian Americans. Like the other parts of Southern Italy, immigration to the island is relatively low compared to other regions of Italy because workers tend to head to Northern Italy instead, in search of better employment and industrial opportunities. The most recent ISTAT figures show around 175,000 immigrants out of the total of almost 5.1 million population (nearly 3.5% of the population); Romanians with more than 50,000 make up the most immigrants, followed by Tunisians, Moroccans, Sri Lankans, Albanians, and others mostly from Eastern Europe. [not in citation given] As in the rest of Italy, the primary religion is Roman Catholicism and the official language is Italian; Sicilian is currently not a recognised language by the Italian Government. Messina and its LUZ, with a total of 418,916 people. Y-Dna haplogroups were found at the following frequencies in Sicily: R1 (29.96%), J (29.77%), E1b1b (21.21%), I (7.62%), G (5.93%), T (5.51%). R1 and I haplogroups are typical in West European populations while J and E1b1b consist of lineages with differential distribution across the Middle East, North Africa and Southern Europe. Further migrations by the Vandals, Normans and Saracens had a small, yet noticeable, effect on the ethnic composition of the Sicilian people. The Norman civilisation proliferated for several centuries on the island, with a strong impact on the culture, and Normans and especially mainland Southern Italians repopulated the island during this time. The Norman Kingdom of Sicily was created in 1130, with Palermo as its capital, and would last until the 18th century. Nowadays it is in north-west Sicily, around Palermo and Trapani, that Norman Y-DNA is the most common, with 8 to 10% of the lineages belonging to haplogroup I. A recent genetic study of Southern Italian and Sicilian populations has shown that Sicilians are very close to mainland Italians from the adjacent regions of Calabria, Basilicata and Apulia. Outside of Italy, according to one study, Greeks from Crete, Laconia, and Peloponnese are genetically closest to Sicilians. According to another study, Sicilians were closest to other southern Italians and Greeks from Crete and the Aegean islands of Greece and Turkey, but distinct from all mainland Greeks. Today, the majority of Sicilians have an average of 37% Greek ancestry. The most common Sicilian names are Giuseppe, Maria and Salvatore. The most common Sicilian surnames are Russo, Messina and Lombardo. Today in Sicily most people are bilingual and speak both Italian and Sicilian, a distinct and historical Romance language of the Italo-Dalmatian family. Many Sicilian words are of Greek origin, while smaller number of other loan words are from Norman, Arabic, Catalan, Spanish and other languages. Dialects related to Sicilian are also spoken in Calabria and Salento; it had a significant influence on the Maltese language. However the use of Sicilian is limited to informal contexts (mostly in family). Sicilian was an early influence in the development of standard Italian, although its use remained confined to an intellectual elite. This was a literary language in Sicily created under the auspices of Frederick II and his court of notaries or Magna Curia which, headed by Giacomo da Lentini, also gave birth to the Sicilian School, widely inspired by troubadour literature. It is in this language that appeared the first sonnet, whose invention is attributed to Giacomo da Lentini himself. Sicilian was also the official language of the Kingdom of Sicily from 1300 to 1543. Prior to the 20th century, large numbers of Sicilian people spoke only Sicilian as their mother tongue, with little or no fluent knowledge of Italian. Today, while Sicilian is an unrecognized language being used as part of many people's daily life, Italian is the only official language and predominates in the public arena. The Siculo-Arabic was a vernacular variety of Arabic once spoken in Sicily and neighbouring Malta between the end of the ninth century and the end of the twelfth century. The language became extinct in Sicily, but in Malta it eventually evolved into what is now the Maltese language. It influenced the dialect of Pantelleria. The Siculish is the macaronic "Sicilianization" of English language words and phrases by immigrants from Sicily to the United States in the early 20th century. Forms of Siculish are also to be found in other Sicilian immigrant communities of English-speaking countries, namely Canada and Australia. A surprising similarity can often be found between these forms, through either coincidence, trans-national movements of Sicilian immigrants, or more likely, through the logical adaptation of English using linguistic norms from the Sicilian language. There are two historical ethno-linguistic minorities in Sicily, the Lombards of Sicily and the Arbëreshë. The Lombards of Sicily are a linguistic minority living in Sicily who speak an isolated variety of Gallo-Italic dialects, the so-called Gallo-Italic of Sicily. The Gallo-Italic of Sicily is a group of Gallo-Italic languages found in about 15 isolated communities of central eastern Sicily. Forming a language island in the Sicilian language, it dates back to migrations from Northern Italy during the era of Roger I of Sicily and his successors. The Lombards of Sicily, who originally hailed from Northern Italy, settled the central and eastern part of Sicily about 900 years ago, during the Norman conquest of Sicily. Because of linguistic differences among the Gallo-Italic dialects of Sicily, it is supposed that there were different immigration routes. From Piedmont, Liguria, Emilia, Lombardy they began to spread south between the 11th and 14th centuries. The most important areas where the Gallo-Italic of Sicily is spoken are Acquedolci, Montalbano Elicona, Novara di Sicilia, Fondachelli-Fantina San Fratello and San Piero Patti (Province of Messina), Aidone, Nicosia, Piazza Armerina and Sperlinga (Province of Enna). Bilingual road signs, in Italian and Arbëresh in Piana degli Albanesi. The Arbëreshë people settled in Southern Italy in the 15th to 18th centuries in several waves of migrations. They are the descendants of mostly Tosk Albanian refugees of Christian faith who fled to Italy after the Albanian conquest and subsequent Islamisation by the Ottoman Turks in the Balkans. They speak their own variant of the Arbëresh language. There are three identified Arbëreshë communities in the province of Palermo, which have maintained unchanged, with different aspects together, the ethnic, linguistic and religious origins. The areas are: Contessa Entellina, Piana degli Albanesi and Santa Cristina Gela; while the varieties of Piana and Santa Cristina Gela are similar enough to be entirely mutually intelligible, the variety of Contessa Entellina is not entirely intelligible. The largest centre is Piana degli Albanesi which, besides being the hub of religious and socio-cultural communities, has guarded and defended their peculiarities intact over time. There are two other communities with a strong historical and linguistic heritage. The community of the Greeks of Messina (or Siculo-Greeks) speaks the modern Greek with some elements of the ancient Greek language spoken in the island, and the Calabrian Greek. The Greek community was reconstituted in 2003 with the name of "Comunità ellenica dello Stretto" (Hellenic Community of the Strait). The vast majority of Sicilians are baptized as Roman Catholic. The Catholic religion represents one of the most important elements of the Sicilian identity. The Virgin Hodegetria is the patroness of Sicily. The Sicilian people are also known for their deep devotion to some Sicilian female saints: the martyrs Agatha and Lucy, respectively patroness of Catania and Syracuse, and the hermitess Rosalia, patroness of Palermo. The Sicilian people has significantly contributed to the history of Christianity. There were four Sicilian Popes (Agatho, Leo II, Sergius I, Stephen III) and a Sicilian Ecumenical Patriarch of Constantinople (Methodios I). Wikimedia Commons has media related to People of Sicily. 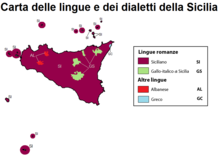 ^ c. 5 million speakers of the Sicilian language in Italy, according to the Ethnologue (includes ethnic Sicilians in southern Calabria. ^ James Minahan, Encyclopedia of the Stateless Nations: Ethnic and National Groups Around the World A-Z, 2002 p.1714. ^ Official site of the U.S.E.F (Unione Siciliana Emigrati e Famiglie). ^ "Statistiche demografiche ISTAT". Demo.istat.it. Retrieved 29 May 2016. ^ "Corriere della Sera – Italia, quasi l'88% si proclama cattolico". corriere.it. ^ "Istat, Demographics, updated to May 2011". Demo.istat.it. Retrieved 28 October 2011. ^ a b "An Ancient Mediterranean Melting Pot: Investigating the Uniparental Genetic Structure and Population History of Sicily and Southern Italy". PLoS ONE. 9: e96074. doi:10.1371/journal.pone.0096074. ^ Paschou, Peristera. "Maritime route of colonization of Europe". Proceedings of the National Academy of Sciences. 111: 9211–9216. doi:10.1073/pnas.1320811111. PMC 4078858. ^ "The Sicilian Language". Leoluca-Criscione.net. 7 October 2007. Archived from the original on 2 March 2005. ^ Toso, Fiorenzo (2010). "Gallo-italica, comunità". Enciclopedia dell'Italiano, Treccani, 2010 (in Italian). Treccani. ^ Ann Katherine Isaacs, Immigration and emigration in historical perspective, Edizioni Plus, Pisa 2007, p, 71.